The Manchester derby is referred to the football matches played between Manchester City and Manchester United. Manchester derbies in the 1970s were frequently bad tempered. In a game in December 1970, a tackle by George Best broke the leg of Glyn Pardoe; the severity of the injury almost resulted in the City defender losing his leg. The Manchester Derby is on par with many other derbies but in 2008 the Derby escalated. Controversy was generated prior to the start of the 2009–10 season when City signed Carlos Tevez after his contract with United ended and erected a billboard reading “Welcome to Manchester” at the top of Deansgate. It provoked Alex Ferguson into claiming City were a “small club with a small mentality” and subsequently called them “noisy neighbours” during the season. The 2009–10 season featured some tense matches including two League Cup semi-final legs. Alex Ferguson went on to say that the 2009–10 Manchester derby at Old Trafford as “probably… the best derby of all time”. Manchester United won the game 4–3 and the match was voted the greatest Premier League game at the ‘Premier League 20 Seasons’ Awards in 2012. With the backing of their new Oil money Manchester City have spent themselves into real contenders. City and United make up around a quarter of EPL revenue alone. Peter Schmeichel, who played for both United and City can claim an unbeaten record in Manchester derby games – United were unbeaten during his eight years at Old Trafford, while in his single season at Maine Road, City beat United at home and picked up a point at Old Trafford. There have been 169 competitive meetings between the two teams. United have won 69 and City 50, the remaining 50 games finishing as draws. The Merseyside derby between Everton and Liverpool is the longest running top-flight derby in England. In the early years of the Merseyside Derby, fan violence was not very prevalent. Traditionally, the Merseyside derby was referred to as the friendly derby as it was common in families for one side to support Everton, while the other root for Liverpool. The 1984 Football League Cup Final at Wembley saw almost all sections of the ground mixed and combined chants of “Merseyside, Merseyside”. Although this derby is typically friendly among fans but the rivalry exists clearly between the players. Unlike other derbies, in Liverpool the violence between Everton and Liverpool fans is a rarity. However, in the fallout from the Heysel Stadium disaster, fan relationships became strained with Everton fans blaming Liverpool for their subsequent ban from European club competitions. However the rivalry has intensified on and off the field and since the inception of the Premier League the Merseyside derby has had more red cards than any other game and has been referred to as “The most ill-disciplined and explosive fixture in the Premier League”. Despite the huge rivalry, Liverpool have completed more direct transfers with Everton than any other club. However, Liverpool did not buy directly from Everton between 1959 and 2000, while there was a similar “freeze” from Everton between 1961 and 1982. Ian Rush of Liverpool holds the mark for the most derby goals with 25. Matches between Everton/Liverpool and Tranmere Rovers, who are based in Birkenhead on the other side of the River Mersey are also Merseyside derbies but as Tranmere have spent all of their history outside the first division, competitive matches are a rarity. Tranmere have occasionally faced Everton and Liverpool in cup competitions. With their last meeting with both clubs came in the FA Cup in 2001 when Tranmere caused an upset by beating Everton 3–0 in the fourth round before losing 4–2 to Liverpool in the quarter-finals. The East London Derby between Millwall and West Ham United is one of the longest-standing, most bitter and fierce derby in English football. They first played against each other in the 1899–1900 FA Cup. Before the First World War the teams met 60 times in just 16 years. Violence has occurred sporadically between the fans once resulting in the death of a Millwall supporter in 1976. 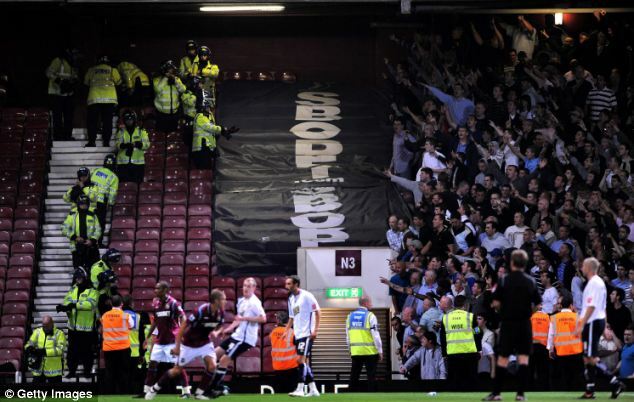 In 2009, Upton Park riot widespread disorder between supporters in and around Upton Park ground led to numerous injuries and a Millwall fan being stabbed before the match began. Both of these teams consider the other to be their no1 enemy. In the 2009–10 season Millwall were drawn away to West Ham in the League Cup which was the first meeting between the teams in the competition. The number of tickets given to travelling Millwall fans was cut from from 3,000 to 1,500 sparking anger among fans. Millwall warned police of a higher probability of trouble. West Ham won the game 3–1, their first win over Millwall in seven games played over in 18 years. Violence marred the match before and after kick-off, and also during the match with multiple pitch invasions by West Ham supporters. A Millwall fan was stabbed outside the ground and suffered a punctured lung, he was one of 20 people injured. The FA brought misconduct charges against both clubs. In 2010–11 season, West Ham manager Avram Grant guided his team to only seven wins from 37 games. West Ham were finally relegated from the Premier League after a 3–2 defeat at Wigan Athletic. During the game a light aircraft flew above the ground, trailing a banner which read “Avram Grant – Millwall Legend”. The plane had been hired by Millwall supporters celebrating Grant’s failure to prevent West Ham’s relegation. Their relegation meant they met Millwall in the 2011–12 Football League Championship. Their first league meeting for seven years ended in a 0–0 draw. The return fixture and most recent game between the two sides was on 4 February 2012 and West Ham beat Millwall 2–1 at Upton Park. Fixtures between Millwall and West Ham United are currently categorised by the Metropolitan Police as category C – games which carry a high risk of disorder amongst supporters. In November 2014 the two sides’ development squads were drawn against each other in the U21 Premier League Cup. Fearing violence at the game the Metropolitan Police demanded the game to be played at 12pm and behind closed doors. 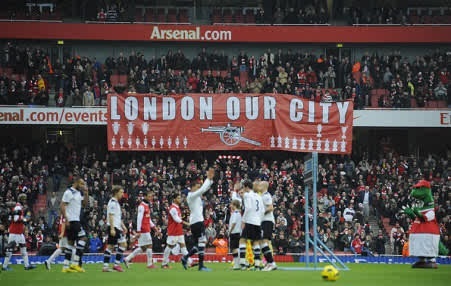 The North London derby is the football local derby between two North London based teams – Arsenal and Tottenham Hotspur. Both teams fans have recognised each other as one of their biggest rivals and the derby is one of the fiercest in English football. The North London derby has been one of the most watched football matches in the world. In 1913 Arsenal moved from the Manor Ground to Arsenal Stadium in Highbury, just four miles from Tottenham’s White Hart Lane. Since then they became Tottenham’s nearest neighbours and thus began a natural local rivalry. The rivalry escalated in 1919 when the First Division was to be expanded by two teams and the League held a meeting of the clubs to decide the two clubs by means of a vote. Chelsea, who were placed 19th would otherwise have been relegated, were allowed to stay and took the first of the two spots. The second place could have been awarded to 20th-placed Tottenham or Barnsleywho finished 3rd in the Second Division. But Arsenal (along with four other clubs) also bid for the place despite their only finishing 6th in Division Two. Arsenal won the vote by eighteen votes to Spurs’ eight and were thus elected to the First Division. It had been frequently alleged that Arsenal chairman used underhand dealings in order to bring this about. The decision infuriated Tottenham and their supporters . Players who transfer between the two teams receive a bad reception from their former fans; an example was defender Sol Campbell, who was nicknamed “Judas” by Spurs fans after he crossed the divide in 2001. Arsenal fans have a celebration day related to the North London rivalry. They celebrate St. Totteringham’s day which is the day in the season when Tottenham cannot mathematically finish above Arsenal on the league table. Spurs fans have declared 14 April to be St Hotspur day in honour of Spurs 3–1 win over Arsenal in the 1991 FA Cup semi final. The North West Derby is a footballing rivalry between the clubs Liverpool and Manchester United. These clubs are also the two most successful teams in England; between them they have won 121 honours: 62 for Manchester United and 59 for Liverpool. It is considered to be one of the biggest rivalry matches in Europe. Both teams are also two of the biggest-earning and widely-supported football clubs in the world. The fixture is usually played at lunchtime due to media interest and to discourage fans from drinking before the game. Liverpool dominated English football from 1975 to 1990 winning 11 league championships and four European Cups. Manchester United have dominated English football since 1993 winning 13 league championships and two European Cups. Both clubs claim the title of ‘the greatest English football club’ having won over 50 major trophies each. Ryan Giggs once claimed that Liverpool against Manchester United is “probably the most famous fixture in English football”. Steven Gerrard took a film crew on tour of his home where he showed off a collection of football shirts he had swapped with opposing players as part of the after match routine; he pointed out that there were no Manchester United shirts in there and that he would never have one of them in his house. Wayne Rooney once described how he grew up hating the Reds. In the 2011–12 season, in the first League meeting of the season it was claimed that Liverpool striker Luis Suárez racially abused United’s Patrice Evra. After considering the evidence, Suarez was banned for eight games. However, when United and Liverpool met again Suarez started the match for the first time since his ban. 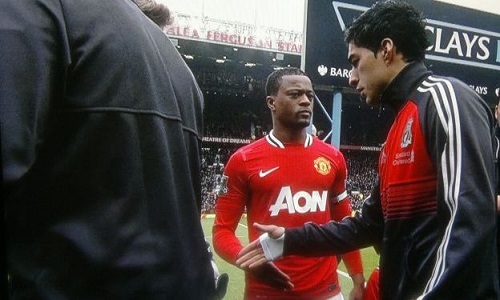 The two teams were expected to shake hands prior to kick-off, but Suarez ignored Evra’s offered hand and moved onto the next United player in line. As a result Rio Ferdinand and Danny Welbeck rejected Suarez’ handshake. Manchester United went on to win 2–1 and Sir Alex Ferguson declared Suarez to be a “disgrace” and suggested that he should not be allowed to play for Liverpool again. Since the 1964 transfer of Phil Chisnall from United to Liverpool , no player has been transferred directly between the two clubs. Some players, however, have played for both clubs but had played elsewhere between each tenure. In 2007 there was a bid from Liverpool to sign Gabriel Heinze from United but United refused to allow him to join their biggest rivals due to the ongoing feud.